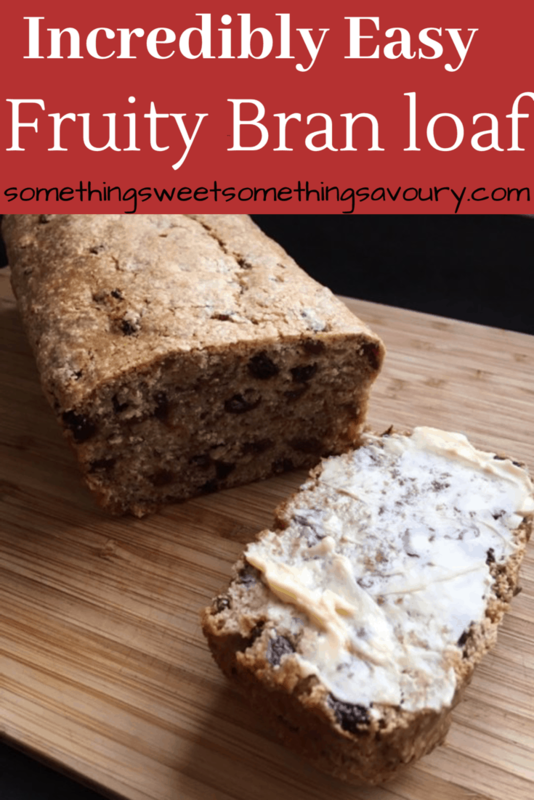 My first recipe of 2018 is a good old fashioned fruity bran loaf. 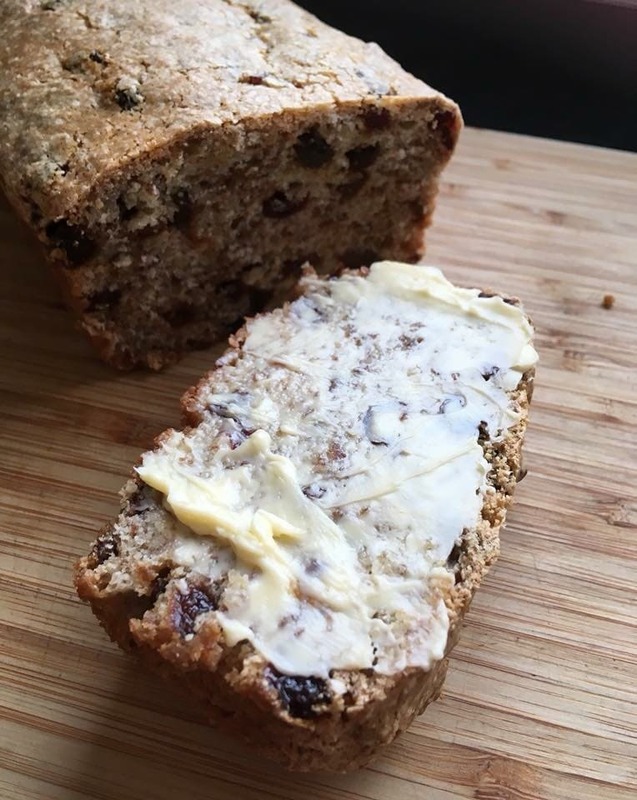 If I’m totally honest, it’s the kind of thing I would have turned my nose up at as a teenager in favour of a massive piece of chocolate cake, but now I just adore a piece of squidgy fruit loaf with my cup of tea. Maybe it’s to do with the fact that we have more discerning tastes when we get older? Who knows? Who cares? These days I just love cake in any form. This is one of the easiest cakes you can make – you measure out all the ingredients in a teacup. Not an American cup measurement. A normal cup is fine. You don’t need to get your scales out for this recipe. Just remember – the bigger the cup, the bigger the loaf which in turn, may affect the baking time. I actually used a small mug to measure my ingredients, but it’s swings and roundabouts really. 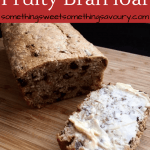 This fruity loaf keeps well for a good few days – I’m not sure if it keeps any longer than that because mine never lasts that long! I love to eat it generously spread with butter. 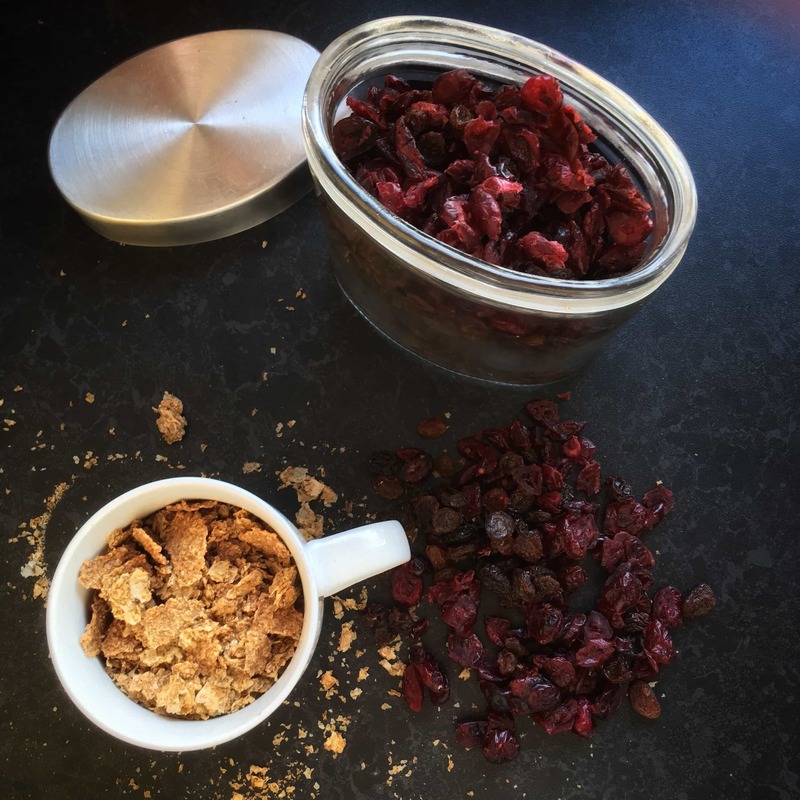 Pour the sugar, dried fruit, milk and bran flakes into a large mixing bowl and stir well. Cover the bowl and leave for one hour. When one hour has passed, preheat the oven to 180C fan 160C/gas mark 4 and lightly butter a 900g/2lb loaf tin. Sift the flour into the fruity mixture and mix gently, taking care not to overmix. Pour the mixture into the lined loaf tin and bake for 50-60 mins or until a sharp knife or skewer inserted in the middle comes out clean. Leave to cool in the tin. This looks lovely, however I’m not a fan of bran! Would oats be worth a try instead? This looks like something I could make and would go down well in this household. Thanks for sharing. No problem, thanks for stopping by! ? I have some bran flakes to use up. That looks like a great recipe. Please – what capacity was your cup? I’m not sure if oats would work Susan – you could try it but I couldn’t guarantee how it would turn out. However if you do try it, let me know how it goes because I’m curious now! ? The cup I used holds 240ml of liquid. Hope this helps! Oh no Maureen! ? It’s so easily done though, I can’t tell you how many times I’ve done similar! Thanks. Using the 240ml capacity I need a 900g/2lb loaf tin. In the oven now. Fingers crossed. Just as well you said about the tin, I just checked and my tin is actually a 2lb one! So I’ve amended the recipe. Sorry! The 2 lb loaf tin was ready at 50 min, which is standard for fruit loaf cakes. Skewer totally clean. Used Tesco “tropical” dried fruit mix. Cooling now so have to wait until tomorrow before trying a slice. Potentially a very flexible recipe. Also, googled around and noticed a similar recipe using rolled oats – think it was on the Hairy Bikers Mums know best. The tropical fruit mix sounds lovely. That’s really interesting to know because someone asked me if you could use oats instead of bran. I’ll need to check the Hairy Bikers recipe out. I have the book so I’ll need to have a look and see if it’s in there. Hope you enjoy the cake! Lovely texture and improves with keeping. Moist. One of the most enjoyable cakes for ages. Just wondering whether a vegan version could be made with a plant/nut milk. No fat or eggs. Remember the quantity fills a 900g/2 lb loaf tin! Next try will be sharp apricots with almond. Dried apple/oear and vanilla or spice woyld be nice. I’m delighted you enjoyed it! Yes it might be worth experimenting with a vegan version. Loving the sound of all your different fruit suggestions. Thanks for the feedback! This us the most flexible recipe ever. A friend gave me some Norfolk lavender sugar for Christmas so I’ve got a apricot and lavender mix soaking at present. Had to use Kellog’s bran flakes because that was all the CoOp convenience shop had. Posh, but choir got fed up with eating bendy biscuits. I’m so pleased you’re enjoying the recipe. The apricot and lavender sounds delicious!